Atlantico Buzios Convention & Resort Hotel, Buzios, Brazil details from BrazilBookers.com. The Atlantico Buzios hotel is situated facing Armação dos Buzios Bay. There are 135 apartments divided into Standard, Deluxe and Super Deluxe category with each room having cable TV, electronic safes, controlled access, hair dryers and na architecture that soothes the guests with relaxation and comfort. Leisure facility is inclusive of beach volley ball and football field, fitness centre, hydro-gym, movies, massage room, 2 swimming pools along with a pool bar, a restaurant and 24 hour room service. 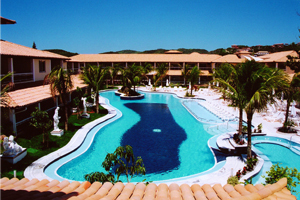 Atlantico Buzios, an exquisite hotel located in the pleasant town of Buzios, Brazil. Buzios is situated some 105 miles from Rio de Jeneiro. With more than 20 magnificent beaches Buzios earns an exotic place in Brazil. The crystal clear water contrasts with alluring landscape making the city divine. The 5 star hotel is located perfectly within 5 minutes walk from the centre of the city and near Armacao beach. Tourists can also take a feel of the night life of the city taking an evening stroll along the Bardot promenade to the “Rua des Pedras” street. 3 more beaches are within walking distance form the grand hotel. The hotel has a very Mediterranean atmosphere giving the guests a feel of the beach. Walking down the outer lanes of the hotel a succession of palm trees and beautifully maintained gardens can be sighted which adds to the quietude. The leisure facilities of the hotel include thermal swimming pool ( outer and inner), a volleyball court , soccer court , sauna , playground , snooker room , cards room , body treatment room , massage room , a fully equipped gymnasium, special bath treatments, stretching and relaxation. Guests who are visiting with their children need not worry about them because the hotel also has a separate room for children recreational activities. The hotel is centrally air conditioned with professional trained staff at your service. Some of the rooms have breathtaking view of the amazing beaches. The staff of the hotel is very efficient and the hotel remains spotless at any time of the day. The reception is eye-catching and has a Hawaiian feel to it. The staff provides a warm welcome and ensures that the rest of the stay is utterly luxurious. 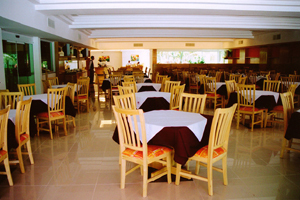 The restaurant of the hotel serves a complete buffet like breakfast. It stays open for room service round the clock. For other meals the guests have a choice between a la carte menu and a self service buffet. The food is gourmet and the restaurant specializes in the local cuisine. The hotel also has a lobby bar and a pool bar to add on an extra tinge to the color and make the pallet beautiful. In all the pool is the best feature of the hotel with the pool bar to the rescue when the sun takes charge. The hotel offers 3 room categories and 5 suites. The reviews suggest that the price is quite reasonable. The booking of the hotel can be done through the net. 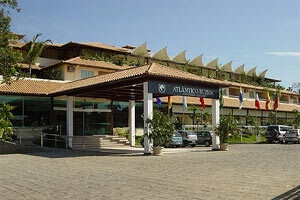 When would you like to stay at Atlantico Buzios Hotel ? 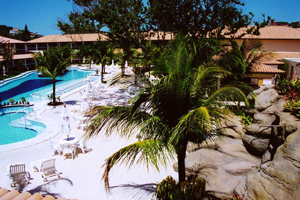 1) Rates at the Atlantico Buzios Hotel may not be valid during Carnival, New Years, Easter and other special dates. © Copyright Bookers International, LLC. All Rights Reserved – Information on Atlantico Buzios Convention & Resort Hotel, Buzios, Brazil details from BrazilBookers.com.